Honeycomb Hive Hat is a close fitting hat with little ‘ears’ that are decorated with pom poms. A double layer band and 2-color honeycomb stitch pattern create dense fabrics that will keep your head nice and toasty warm. The hat is worked from the bottom up in the round. 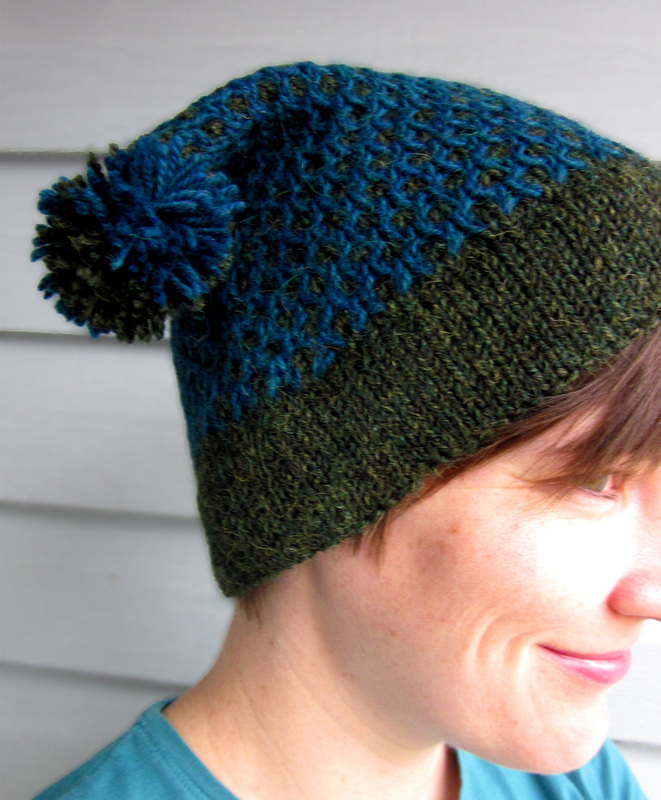 With no shaping and an intuitive stitch pattern, this hat is a relatively easy knit. The top of the hat is finished with a three needle bind off. Honeycomb Hive Hat is sized to fit the whole family. When choosing your size, it is recommended to have 2” negative ease. Sample shown in adult S.
Berroco Ultra Alpaca (50% alpaca, 50% wool; 215 yds/198 m per 100 g ball); Color A: 6277 Peat Mix, 1 (1, 1, 1, 1, 2) skeins; Color B: 6285 Oceanic Mix, 1 skein. 28 sts and 28 rounds = 4” in 2-color Honeycomb pattern. Check gauge in both stitch patterns. Designer note: I am a loose knitter, so please check your gauge before beginning this project. It may be necessary to go up 1 or 2 needle sizes. For this pattern it is important to check your gauge in both stitch patterns and adjust both needle sizes if necessary.